It is imperative that you buy good quality leather at appropriate weights. A leather weighing more than 2 oz becomes thick. You can also buy recycled ones for ethical reasons. There are several options online to make your purchase. 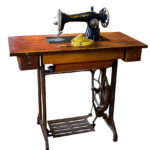 Before you begin sewing, it is necessary to arm yourself with core competencies. Gather all the tools and supplies beforehand. Make sure to grab a packet of leather needles. It is ideal to purchase them because they are explicitly crafted to handle faux leather and leather without damaging the hide. Leather needles feature with a minor cutting point so; it is essential to change them frequently. The leather tends to cling to the needle plate, so it is advised to use a regular walking or a Teflon foot. For a better glide, frosted tape solves the purpose. Before practicing on leather, choose old clothes to arrive at the right stitch length. Ensure that you avoid making undesirable holes in the leather. Select hairpins or bulldog clips to clutch both the seams. Any mistake in the process will force you to remove the stitches which in turn weakens the seam. Leather does not allow you to backstitch. After sewing, pull the thread back and secure it with a hand knot along the stitching line. At the seam intersections, where the leather becomes bulky choose a hump jumper to sew evenly. Utilizing durable polyester thread for sewing is imperative. Ensure to inspect your leather thoroughly for any weakness or flaws before stitching. You can choose to interface the weak areas to stabilize them. Always cut through a single layer. You can either use a rotary cutter or scissors to make your cuts. It is essential to mark the notches on the back side of the leather. The stability of leather is greater in the center than at the borders, so group the parts accordingly. Before sewing, make sure to prepare yourself adequately.